Edamame -- unripened green soybeans fresh from the pod -- are among the few plant-based foods that supply complete protein. From the Japanese for “beans on branches,” edamame have long been a staple in Japanese cuisine but were largely unfamiliar to American consumers until the closing decades of the 20th century. Boiled or steamed in their pods and then shelled, edamame make a tasty vegetable side dish; when dried, they’re a healthy and crunchy snack. Early-maturing, high-yielding variety with large, buttery seeds. 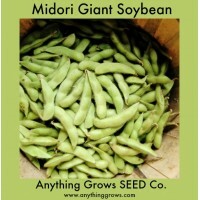 Rich, flavorful beans; one of the most popular soybeans for edamame. Consistently yields over 90% two and three-seeded pods with a clear pubescence. Well-branched, tall and sturdy plants. Widely adapted throughout the U.S. and Canada. A sure winner for both commercial production and home gardeners! Reliable producer · Highly vigorous plants (Glycine max). Maturity 80-95 days ..